“Lemon tree very pretty, and the lemon flower is sweet, but the fruit of the poor lemon, is impossible to eat” sang Freddie Fender. I strongly disagree old Freddie boy. Sure you don’t pop lemons in your mouth like you would apples, but neither do you pop limes either. Lemons are super for drinks, and there are various ways that lemons make their way into our daily lives – but Lemon Pudding and Lemon Meringue Pie are two that have left a sweet after taste for me. Lemon Meringue Pie or “LMP” as it is fondly referred to by my husband, was a thorn in my side. I had been trying to perfect this dessert for years but could never quite achieve that superlative result that I was seeking. Either the crust was too flaky or the lemon filling didn’t have the required texture or even worse, the meringue would not sit properly! Then there was the issue of not being able to find suitable lemons in the market, but then these are all just excuses. After much perseverance, I have finally managed to perfect it and I am quite pleased with the result. 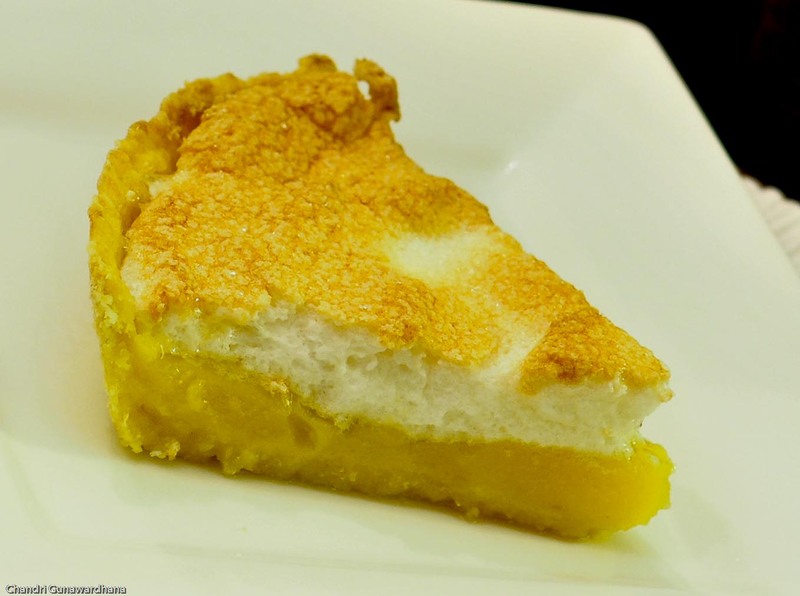 For me, the perfect lemon meringue pie should have a buttery crust which is slightly sweet and melts in the mouth. The custard should be lemony not bitter and the texture must be firm to the touch yet not too jelly-like. The correct amount of corn flour has to be used to achieve this fine balance, otherwise, if too much is used, the filling will not taste nice, or if too little is used, it will not set properly. The meringue should be whipped until stiff and the correct amount of sugar should be added. When baking, care should be taken not to brown the meringue too much. What a delicious dessert to have on a cold and rainy evening! Ahhhhh! No “wasted days or wasted nights” (dear Freddie), when there’s LMP by your side…..hey, is that a song in the making??!! Tee hee hee! And by the way, I’ll be posting an article on Lemon Pudding soon, so keep a lookout!